Menulog delivers for Katsumoto so you'll be able to track your courier on a map. Deep fried pork, hard boiled egg and pickles on steamed rice with Japanese curry. Cold noodles in a sweet and sour soup with ham, sweet egg, cucumber, seaweed, mustard and pickled ginger. 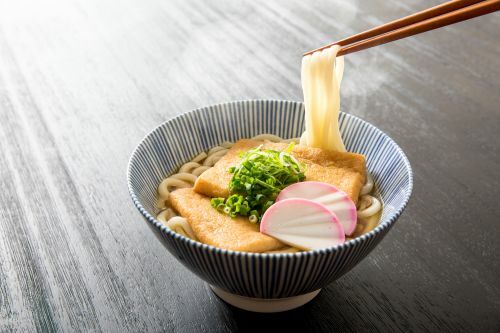 Japanese wheat noodles with fish cake, fish balls, inari, spring onions, mushroom and seaweed in soup. Deep fried eggplant with sweet miso sauce, sesame seeds, accompanied by steamed rice, salad, miso soup and pickles. Pan fried chicken in sweet teriyaki sauce with sweet egg, seaweed, with steamed rice and pickles. Deep fried crumbled creamy vegetable accompanied by steamed rice, salad, miso soup, pickles and tonkatsu sauce. Pan fried chicken in sweet teriyaki sauce, accompanied by steamed rice, miso soup, salad and pickles. Skewered chicken with onions, chicken balls in sweet teriyaki sauce, accompanied by steamed rice, miso soup, salad and pickles. Deep fried, crumbed pork accompanied by steamed rice, salad, miso soup, pickles, mayonnaise, mustard and tonkatsu sauce. Deep fried, crumbed creamy crab accompanied by steamed rice, salad, miso soup, pickles and tonkatsu sauce. Chicken surrounded by egg, onions, and spring onions. Topped with seaweed, over steamed rice, accompanied by miso soup and pickles. Deep fried pork surrounded by egg, onions, and spring onions. Topped with seaweed, over steamed rice, accompanied by miso soup and pickles. Eel in sweet teriyaki sauce with sweet egg, seaweed, accompanied by steamed rice and pickles. One set. Deep fried breaded prawn with steamed rice and miso soup. 340ml Can. "Sangaria" Japanese iced teas. Made in Japan. 335ml. Japanese uncarbonated soft drink. Pokka Oolong Tea promises a balance between a rich and robust roasted flavour and distinctively smooth taste. Had a heavy, oily meal? degrease and lighten up with Pokka Oolong Tea! 330ml. Henry Soda is a great tasting, all-natural, 100% Australian owned soda with no nasties and nothing artificial. Can. Aloe vera with pulp bits plus peach juice. Share some unforgettable, magical moments with Pokka. The rich summer fragrance of peach juice is mixed with crunchy bits of aloe vera for that fun-filled experience. It contains vitamin C and is free from preservatives, it is the perfect enjoyment anytime, any place for whatever your mood is. COUNTRY OF ORIGIN: Malaysia. 350ml. “Kobe Kyoryuchi” Grape Cider carbonated beverage. Imported from Japan. 350ml Regular Can. "SUNTORY" All-Free is an alcohol-free beer that you can drink without worrying about alcohol content, calories, or carbohydrates. It can be enjoyed in a wide variety of scenarios, by beer lovers who have plans the following day, are giving their liver a rest or are enjoying a weekend brunch or weekday breather or by those who cannot drink but want to enjoy a feeling of participation in drinking parties with colleagues, family or friends. Made in Japan.